Poland has taken the quest for eco-friendly infrastructure solutions to a beautiful level. 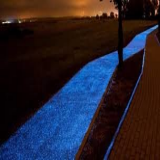 A brand new glow-in-the-dark cycle lane, powered entirely by the sun, has been unveiled near Lidzbark Warminski in the north of the country. 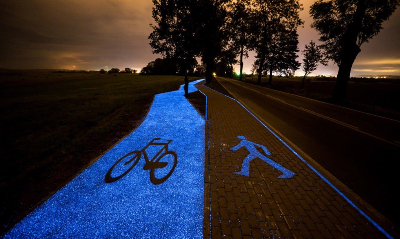 The path is made of a light-emitting material that can glow the entire night, bathing cyclists in a calming blue glow. This is moonlight cycling at its best. 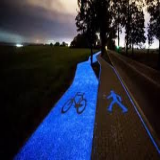 As an early Christmas gift to its cyclists, Poland has rolled out a 330-foot strip of road illuminated at night by phosphor, a synthetic material that lights up after it’s charged by sunlight. The eye-catching blue road, created by construction company TPA Instytut Badan Technicznych in Pruszkow, is still in the test phase. 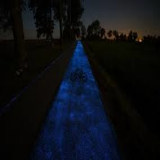 The lane uses luminophores – chemicals that “ingest” light – to keep the bike path beautifully and naturally lit at night. They chose blue to “match the Mazurian landscape” where lakes abound. The Polish innovation requires no additional power supply. This means that pedestrians in Pruszkow can stroll along a lit pathway for up to ten hours at night and ride over the same path the next day as it self-charges. Although the blue path is beautiful and safer than a traditional roadway, it is significantly more expensive (the company has yet to reveal figures), which is why the current iteration doesn't cover much ground. The contractors are researching various options to optimize production costs so that the technology can more easily spread to other locations. Note: Masuria is a region in northern Poland famous for its 2,000 lakes. Why is it generating interest? The path is so beautiful you cannot resist cycling on it. If the cost of construction can be brought down, the world will see many more such lanes. Poland has given an absolutely beautiful reason for its people to love cycling more and embrace a healthier lifestyle. The news is sending ripples throughout the world, owing to the sheer brilliance and simplicity of the concept.It is not just using a readily available energy innovatively; it is also giving a reason to embrace the healthy habit of cycling. Work began about a year ago, with lab tests into how the glowing effect would be created. A variety of different materials and colours were tested, with the aim of creating something that would both look great and that would increase safety for cyclists and pedestrians. It is incredibly nice and soothing to look at. The company chose the town of Olsztyn in the Masurian Lakes District of Poland to test it out, partly because the landscape created an attractive setting. The material gains its ability to store sunlight by mixing particles called lumiphores with asphalt. 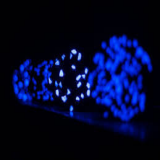 These use the chemical properties of phosphorous to create the glowing effect. 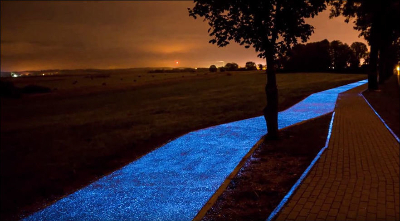 Exposure to 30-60 minutes of daylight is enough to make the path glow for at least eight hours overnight.Innovators believe the material should retain its glowing properties for about 20 years. As part of the trial, the durability of the glow-in-the-dark section is being observed under real-world conditions. When has this been done before? Yes, this has been done before - more or less. 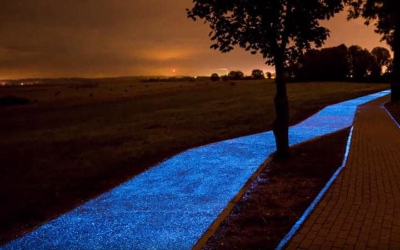 Two years ago, on the 125th anniversary of Vincent van Gogh’s death, the Dutch town of Eindhoven built a twinkling 1,970-foot path that evokes the artist’s famous swirls in the painting Starry Night. Under the innovative eye of Dutch designer Daan Roosegaarde and the capable hands of Heijmans construction company, 1,970 feet of the Van Gogh Cycling Route connecting Eindhoven with the town of Nuenen, where Van Gogh himself resided from 1883 to 1885, was transformed into a work of solar-powered “techno-poetry” evoking the familiar swirls of Starry Night. Pointillism is a technique of painting in which small, distinct dots of colour are applied in patterns to form an image.The pointillist effect created by thousands of luminescent blue-green rocks was achieved with a polishing technique that cocoons each stone within a photosensitive coating. Laid in wet concrete, the pathway was buffed smooth for the benefit of cyclists. In keeping with the energy-neutral philosophy behind the project, the luminescence of the path was been carefully calibrated not to disturb the sleep cycles of local fauna. Note: The Starry Night is an oil on canvas by the Dutch post-impressionist painter Vincent van Gogh. Painted in June 1889, it depicts the view from the east-facing window of his asylum room at Saint-Rémy-de-Provence, just before sunrise, with the addition of an idealized village.It is regarded as among Van Gogh's finest works, and is one of the most recognized paintings in the history of Western culture. Where are the likely benefits? It is not known how long it will take for its luminescent properties to wear out, but, aside from encouraging a healthy lifestyle, it seems like a brilliant way of improving the safety of people biking at night. Biking on a narrow path next to a road in the dark may have been dangerous before, but is now turned into an exciting experience. The mixture was applied to an existing asphalt bike path and, for additional safety this was covered with a layer of small stone grits. Who is the pioneer of such futuristic projects? 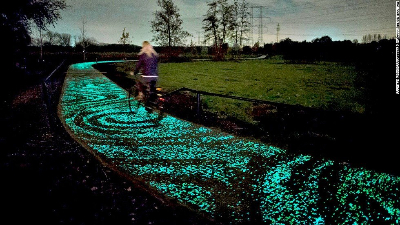 Daan Roosegaarde, who created the Van Gogh cycling path, is a Dutch artist and innovator. 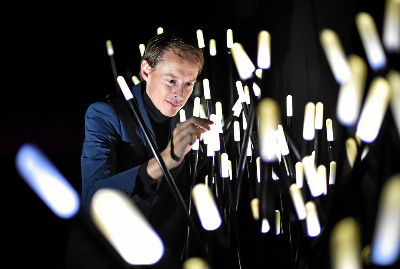 He is the founder of Studio Roosegaarde, best known for creating landscapes of the future and exploring relations between people, technology and space. He studied at the Institute for the Arts in Arnhem (1997–1999), the Academy of Fine Arts in Enschede (2001–2003), and the Berlage Institute in Rotterdam (2003–2005). Roosegaarde's recent occupation is the Smog Free Project, where using patented ion technology he is building the world's largest smog vacuum cleaner. The Smog Free Tower produces smog-free bubbles of public space, allowing people to breathe and experience clean air for free. In order to create a tangible souvenir, Roosegaarde designed Smog Free Rings and Smog Free Cufflinks made of compressed smog particles from Smog Free Tower. Rainbow Station, an artwork made in collaboration with Leiden University was launched in honour of the renovated 125-year-old historic Amsterdam Central Station. Rainbow Station can be seen every day for a year for a brief moment within an hour after sunset. Lotus 7.0 is a living interactive wall which had its premiere in Paris. When approaching the installation, hundreds of flowers made out of smart foils blossom. "We are at the dawn of a new nature," says Daan Roosegaarde. 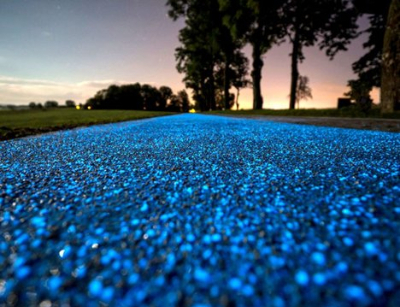 How could the glow-in-the-dark roads become a reality soon? Scientist José Carlos Rubio wanted to see if he could figure out a way to illuminate highways and roads at night – without using electricity. He soon discovered a truly innovative solution; he found that by altering the fine structure of cement, he could design a variety that appears to glow in the dark. Rubio has been researching the cement for 9 years. He said the first problem to tackle was the fact that cement is opaque. He started to dig into the cement-making process. In one way of creating cement, it starts out as dust mixed with water. As it begins to gel, crystal flakes form.The flakes are an unnecessary by-product, so Rubio discovered a way to change the microstructure of cement so they wouldn’t be present. This result in a thrilling effect:his cement without crystals can absorb solar energy and emit it as light at night. According to Rubio, the light-emitting product could last for 100 years and provide light for around 12 hours at night. 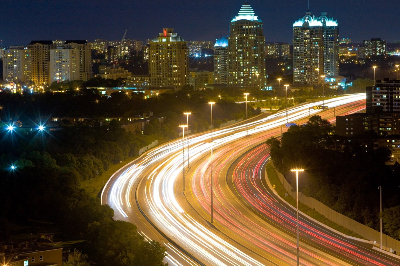 The intensity of light emitted can be changed so it doesn’t overwhelm drivers or cyclists. The light glows as a cool green or blue. Not only would the cement save power, but the process to create it is environmentally friendly as well. During manufacturing, the only thing released is water vapour. There are a wide variety of commercial applications; according to Rubio, four billion tons of cement were created throughout the world in 2015, and the glowing cement can be used not only for streets but buildings as well. The technology could even be used in plaster. Rubio’s research is fast reaching the commercialization phase.